This proposed project will help with projected future traffic volumes, including a large number of commuters traveling in that area, according to FDOT. PINELLAS COUNTY, Fla. — The Florida Department of Transportation is looking to make widespread improvements to U.S. 19 in Pinellas County, specifically from 66th Avenue N. to SR 690/118th Avenue N.
This proposed project will help with projected future traffic volumes, including a large number of commuters traveling in that area, according to FDOT. The goal is to improve traffic flow and safety. Widening US 19 from south of 70th Avenue to 80th Avenue to accommodate additional turn lanes and bicycle lanes. Upgrading the Gandy/Park Boulevard interchange to include dual left turn lanes on each roadway and ramp approach and dual right turn lanes on the westbound ramp approach. 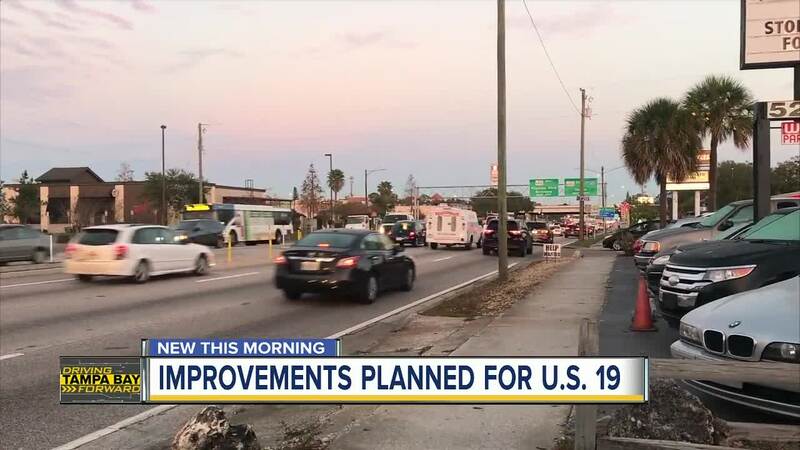 Construction of auxiliary lanes along US 19 and Park Boulevard, and replacement of the bridge over US 19 would be included in a future project. Some of the long-term improvement plans include widening the the existing 6-lane roadway from 66th Avenue North to Gandy Blvd. It would include one new auxiliary lane in each direction, 7-foot buffered bicycle lanes, and 6-foot sidewalks. All lanes will be 11 feet wide, according to FDOT. In terms of a timeline, FDOT is looking to create the design of this project in 2019/2020 for the short-term improvements and fix the right of way in 2023. However, these construction plans are not funded yet.